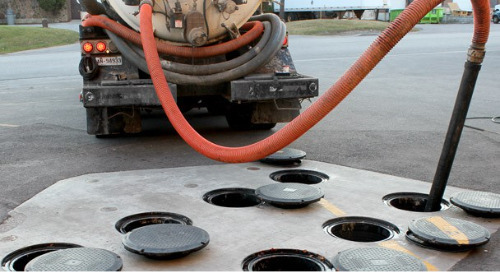 Grease is putting major stress on sewer systems. 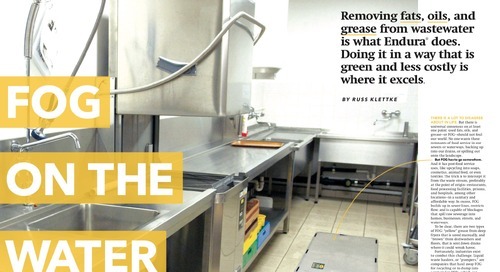 Even more stressful to restaurant owners, grease can be the cause of costly backups that have damaging effects on business. How big is this FOG (Fats, Oils and Grease) problem? Likely a lot fatter than you can imagine. Consider this: in the eastern area of London, U.K., a 230 metre, 130 tonne mass of grease and debris – dubbed a “monster fatberg” – blocked the old Victorian-era sewer tunnel. To put that in some kind of perspective, that’s nearly as heavy as a blue whale. Similar situations have occurred stateside as well. 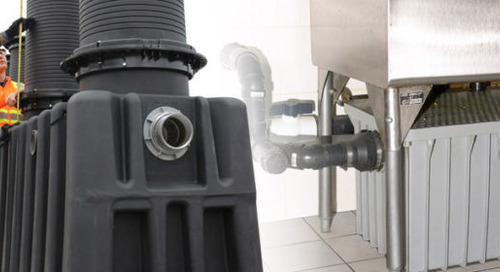 According to an article in Crain’s New York Business, between 2011 and 2016 the city of New York received a whopping 15,000 reports of grease-induced sewer clogs. In the borough of Queen’s alone, 85% of all blockages were FOG related, causing an average of 3 reported blockages every day. This is a heavy burden on the city coffers – costing $15.5 million in 2016 alone. As expected, restaurants are the overwhelming source of the issue. 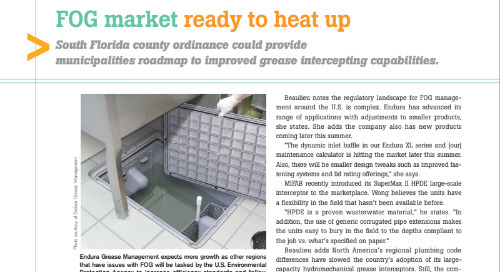 In the U.S., the average full-service restaurant releases approximately 16,000 lbs of FOG into the wastewater system every year. Picture a typical night where 150 meals are served; that would result in 16 to 20 lbs of grease sent down the kitchen’s drains. 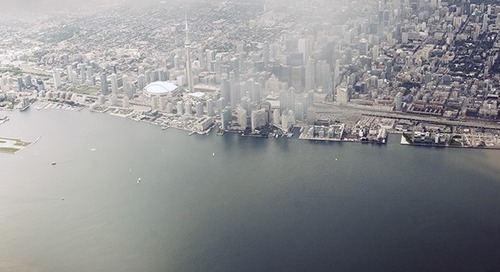 The concentration of FOG in wastewater has been found to range from 1000mg to 2000mg per litre – well beyond the manageable limits for most water treatment plants. 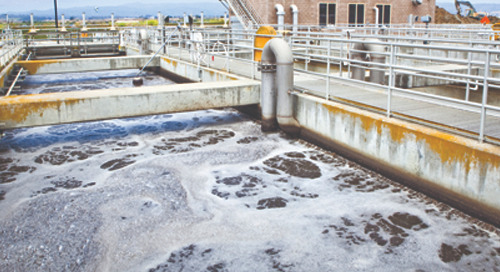 To avoid clogs and comply with established limits, FOG in wastewater would have to be less than 200mg per litre. 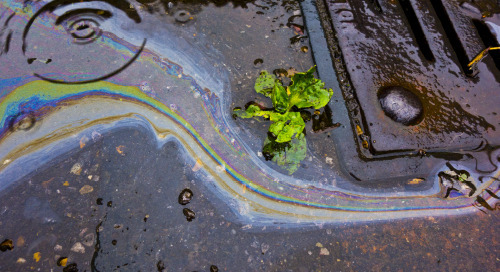 Theoretically, the solution is simple – stop dumping grease down the drain. In the past, this has been easier said than done. Thanks to some technological innovation, practical solutions are becoming more widely available. 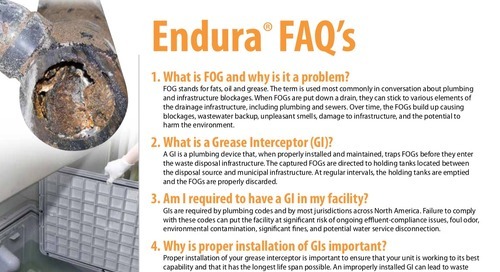 Endura’s® Hydromechanical Grease Interceptors (HGIs) provide effective removal of FOG from wastewater. Determining the right size of an HGI is crucial to proper performance. 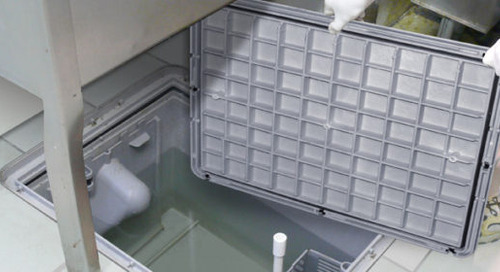 New standards by the American Society of Plumbers and Engineers (ASPE) have established a more comprehensive means of determining the size of GI required. 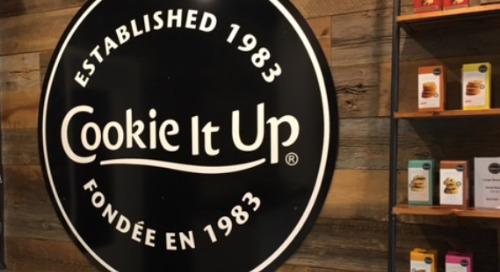 A number of factors are now recommended for consideration in order to provide restaurants with more well-rounded sizing guidance: the number of meals being served, whether the meals are served in-house (requiring dishes) or, if it’s a take-out facility, the type of cuisine. 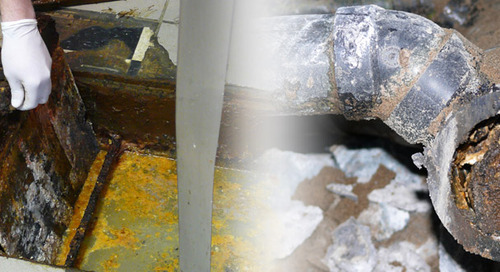 All GIs need to have the intercepted grease removed at regular intervals. 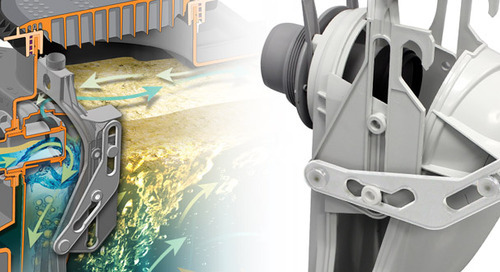 How frequently the grease is removed can vary depending on the unit model as well as local codes, with ninety days typically being the maximum interval. In recent years there has been a demand for higher performing, higher capacity HGIs. 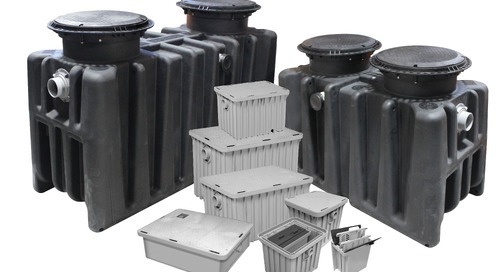 These typically have a rated flow of 75 gallons per minute or more, and their grease capacity is double that of traditional high-capacity GIs. 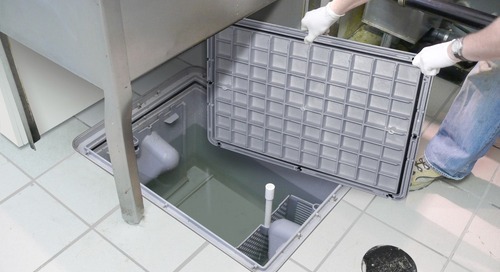 This is a great alternative for high-grease producing food services that would have required a Gravity Grease Interceptor (GGI) – a much bigger unit that required substantially more space – in the past. 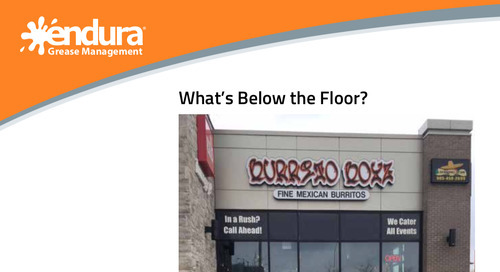 Today, Endura® HGIs provide superior performance and high capacity while being far more space-efficient than a GGI; and, a HGIs higher capacity can extend the grease removal interval as well – an appealing benefit in a busy restaurant’s kitchen. 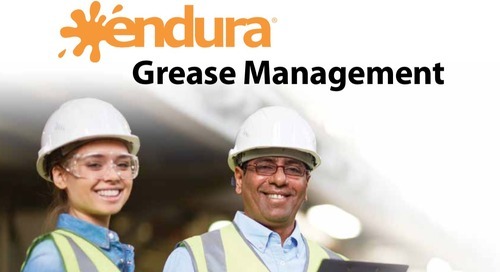 Endura® Grease Management is pleased to provide you with the Endura® Calculator to aid with determining the size of Grease Interceptor required. 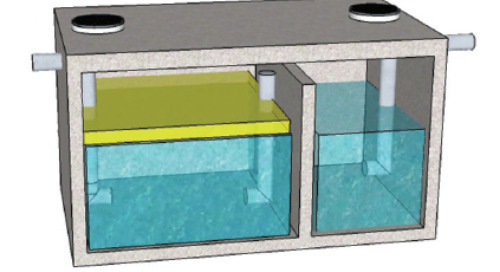 The calculator utilizes a two-step sizing method that allows for proper interceptor sizing based on calculated flow rate and/or DFUs (Drainage Fixture Units) conditions as well as maintenance interval optimization. 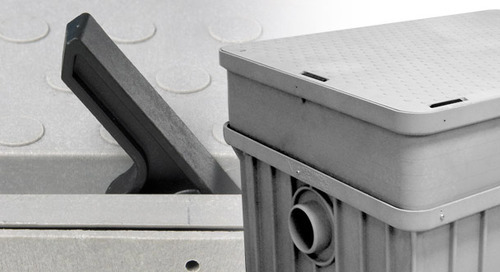 The maintenance interval calculations are based on widely accepted ASPE design criteria to ensure uniformity and acceptance. The calculator also includes helpful quick tools that allow for maintenance interval calculations of existing installations. 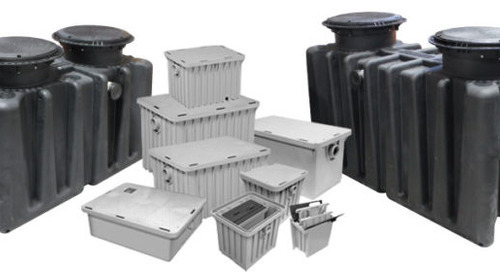 The required performance standards of Grease Interceptors do vary by region. It is important to consult local codes prior to product selection to ensure those requirements will be met.